Posted by Jon in Masters of the Universe with 0 comments. If you are anything like me and miss those amazing statues the Four Horsemen did for the MYP Masters of the Universe series you could possibly be in luck. Jerry Macaluso, the man in charge of his own company Pop Culture Shock, posted on Facebook this evening asking what style He-Man fans would like in a quarter scale statue. 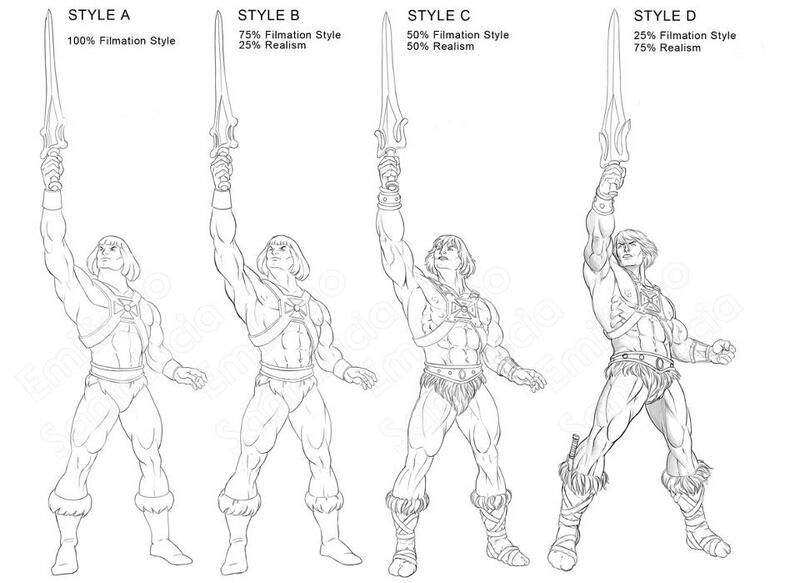 Jerry drew up four proposed styles from 100% Filmation to 25% Filmation/75% Realism. Personally I am hoping for either option C or D with a preference to D. What does everyone else think? So if you check out Pop Culture Shock’s facebook page you can let your voice be heard. While you are there you can marvel at his incredible Street Fighter statues. Their statues get a bit pricey, but they are some of the finest quality works you can find. It’s nice to see Mattel finally expanding on the brand past the classics line, quite a few companies putting out MOTU merchandise finally.